Well, this one's a bit different. Elrond Lawrence's book "Route 66 Railway" convinced me that I should go take a look and see what was left of Route 66's artifacts. Disc 1 takes a look at California, from San Bernardino, over Cajon, through Victorville to Barstow, and across the Mojave to Needles and the bridge at Topok. Disc 2 takes a look at Arizona, from Kingman Canyon to Flagstaff and on to Canyon Diablo, Winslow, Holbrook and the the NM border at Lupton. In addition to the trains, you'll see neon, abandoned gas stations, tourist traps and restored depots. This is the 9th video in Highball's Rail Adventure series. Made famous in "The Grapes of Wrath" book and movie as the escape route from the Dust Bowl of the 1930s and immortalized by a blue Corvette, Martin Milner and George Maharis on the 1960s TV show "Route 66", Historic Route 66 is probably the most famous highway in the world. And fortunately for railfans, Route 66 closely parallels BNSF's former Santa Fe Transcon much of the way from Chicago to Santa Monica Pier. 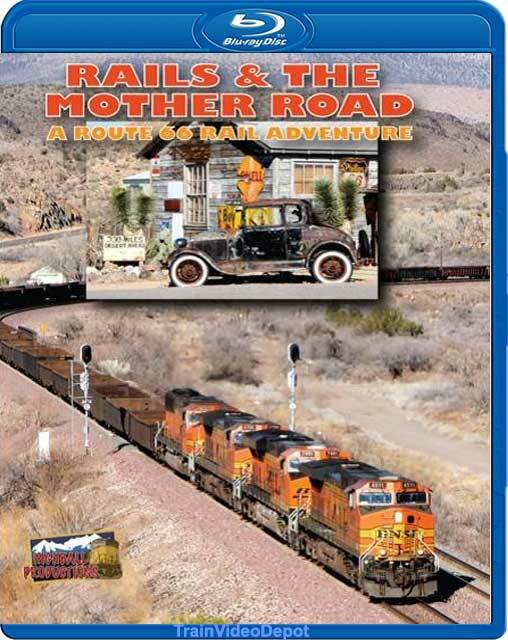 This Rail Adventure 2 disc set covers the highway between San Bernardino through Cajon Pass, the Mohave Desert and Northern Arizona to the Arizona-New Mexico border. This video is in the 16X9 Widescreen format. <p>Disc One starts off with shots of the San Bernardino Amtrak and Metrolink station then moves to the recently triple tracked Cajon Pass. We are treated to some spectacular wide scenic shots showing the BNSF and UP tracks and the Mother Road. Our first view of Route 66 attractions is the Summit Inn Cafe and the Texaco gas station at the Summit on Cajon Pass. Then we see one of the many oddities of Route 66 attractions, the Bottle Ranch with "trees" made of old glass bottles. Next is Barstow's Harvey House, Western Railroad Museum and night shots of some of the many neon light signs along Route 66. Other highlights include Daggett and Ludlow, Amboy and the now closed but well preserved Roy's Motel Cafe, the Shoe Tree, Essex, Goffs, Needles, Topock and, of course, lots of trains. Unfortunately, most of the structures along this stretch of Route 66 are abandoned. 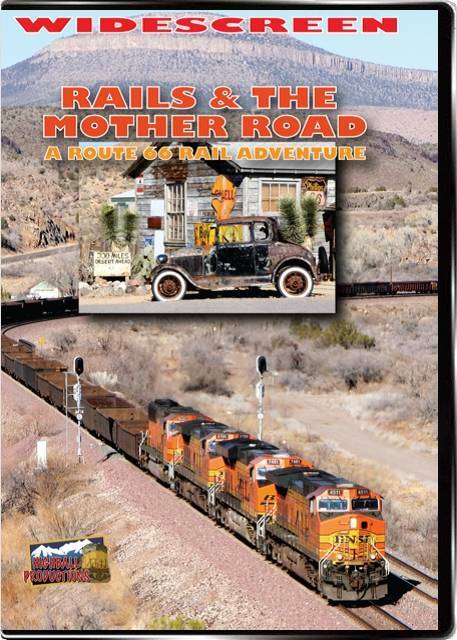 <p>Disc Two starts out in Kingman Canyon with an explanation of Route 66's presence in the canyon followed by a quick look at some of the Kingman attractions on Route 66. Next we see the Hackberry General Store (now apparently a museum) which has a Corvette on display similar to the one used by Bus and Tod in the Route 66 TV show. Other highlights include Crozier Canyon, Seligman, a recreation of one of the Burma Shave series of roadside signs, Williams with a look at the Grand Canyon Railway and some neon sign night shots, Flagstaff (it's interesting how the town was named), Darling, Canyon Diablo, Winslow with a look at Standing On The Corner Park (a tribute to the Eagles "Take It Easy" song and the La Posada Harvey House, Holbrook with a look at the Wig Wam Motel, the Petrified Forest National Park, and Lupton. train-nut (Manteca Ca) on 2011-04-24 12:16:27. First off , when history, and today's railroading are mixed you can't go wrong!!!! WOW what excellent work!!! Great work highball productions!!! Love it!!! :-) A MUST HAVE!!! Basically an all BNSF consist of trains (intermodal,mixed freight,etc) along route 66. With most of the action in Arizona (mostly desert). The photography is excellent!!! Very sharp and clear, and very interesting angles not usually seen in rail videos. There are a lot of shots of the locomotives close up (I like this a lot). On a 50" Sony widescreen the BNSF GE C44-9 looks pretty cool! The Author of this video uses a Sony Widescreen HD camcorder which cost about $15,000, and it shows in the quality of this video (Bluray). Also shown in this video are a lot of Route 66 landmarks...kinda cool. Now this is the type of disc to enjoy. Information about the towns and viewing route should be standard in train DVDs for those of us overseas or not able to visit the locations. This allows the viewer a complete picture of the railroad fitting into the country. This is a real train fan documentary. There is a minor production blemish on my disc, and I would have preferred the movie on two Blu-Ray discs as it on the DVD. Great feature film. This video is good for railfans. The route is nothing new from past productions and other producers. There is some historical interest here. Having ssen seen other Highball productions on the Mojave/Arizona region there is not really to much to be added. I guess the biggest improvement is that it is a Blu-ray which gives a better quality look. Rail Buff (Southern California) on 2015-12-01 10:27:38. I have to eat crow after posting that it'd be a long time before I bought another Highball Production after my two previous pans of their product. However, they hit this one completely out of the ballpark. I enjoyed it immensely, especially the first disc. Had some great shots of the Cajon Pass from different places from where it is usually filmed. I've driven over the Cajon Pass probably hundreds of times plus I have also driven Route 66 a few time before the Interstates were built. Thus lots of nostalgia for me, which I loved. Second disc, they seemed to lapse into their usual habit of setting up near protected grade crossings with the incessant clanging of the warning bells, but not too much as in other of their productions. I guess old habits die hard. Air2k757 (Texas) on 2012-07-17 12:13:12. Beautiful shots and scenery. Cheesy period music and excessive shots of non train related items.